This painting was commissioned by my good friend, Donald, for an art auction as part of the Gutter Boys Third Annual Bowl-a-Thon to benefit AIDS CARE/Hampshire County. Three fun hours of bowling at your leisure or faster for more games. There are plenty of baskets to win in separate raffle drawings as well as a silent art auction. Don’t miss this opportunity to help many of your friends, family and neighbors in Hampshire County living with AIDS. The first two bowl-a-thons raised over $700 and $1,100. The goal for this year is to raise $1,500. For more information and updates, check out the Facebook Event. Note from Wayne: Good luck finding your sun, Kevin N.
Inspired by Larry and Forest as well as their music and baked potatoes. Sketching on a sunny August day in Provincetown, MA. This, my friends, is living the dream. Note from Wayne: While typing poems (using my Smith Corona Galaxie Twelve) at the 2012 Granby Dinosaur Festival, two lovely ladies influenced these two poems. 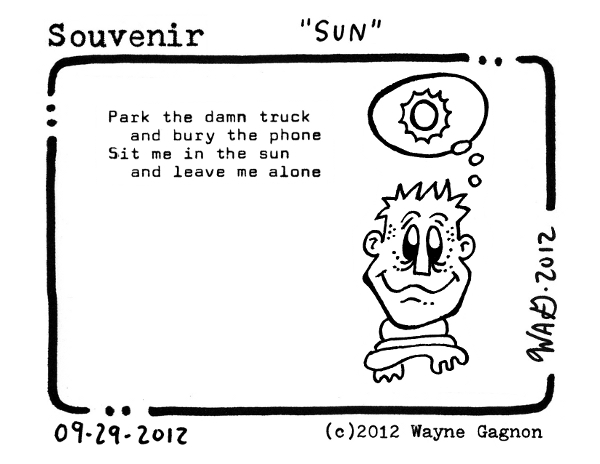 Another note from Wayne: Lately, I’ve been using my Hermes 3000 Typewriter for “Souvenir.” It’s been going quite well.